What's Up Doc? is a 1949 Looney Tunes cartoon directed by Robert McKimson and released by Warner Bros. Pictures in 1950 to celebrate Bugs Bunny's 10th birthday that year, in which he recounts his life story to a reporter from "Disassociated Press." Bugs talks about his birth, his rise to fame, the slow years, and when famous Vaudeville performer Elmer Fudd chooses him to be part of his act. Eventually the duo comes upon their classic formula of Hunter vs. Hare. At the start of the cartoon, Bugs is shown living in a 1930s/1940s Modernist house. Early in Bugs' career, there is a gag repeated several times, in which there is a sign marquee featuring three of Bugs' Broadway appearances (Girl of the Golden Vest, Wearing of the Grin, and Rosie's Cheeks). Music starts, the curtain rises, and Bugs Bunny and the Chorus Boys walk on stage, singing and dancing, "Oh we're the boys of the chorus/We hope you like our show/We know you're rooting for us/but now we have to go." After Bugs has become a star through the course of the cartoon, the closing sequence has Bugs and the Chorus Boys performing that same routine again to Bugs' disgust (as shown on his face). This repetitive gag is similar to one used in Gene Kelly's musical Singin' in the Rain. Bugs throws away many scripts he's considering, one of them including Life with Father. Bugs predicts: "Eh, this will never be a hit!" In reality, the play was a big success, with over 3,000 performances and a rather lengthy run (from 1939-1947), making it the longest running non-musical on Broadway so far. Warners made it into a film of the same year the play ended. Al Jolson, Jack Benny, Eddie Cantor and Bing Crosby appear, through caricatures, in a park with Bugs, all of them out of work. Jolson spots Elmer, a big vaudeville star, and tells the others that Elmer is looking for a partner. The four then do their trademark phrases/songs, but Elmer ignores them. When the "fathead" reaches Bugs, he says, "Why are you hanging around these guys? They'll never amount to anything." All four of these stars were often caricatured in WB cartoons, and in fact, Cantor helped write the long-running theme song to the Merrie Melodies series, "Merrily We Roll Along" (which a Cantor impersonator sang in two early cartoons). Bugs' classic catchphrase is shown in this film to have been originally an accident. It came from Bugs after he pied Elmer in the face and bonked him on the head with a mallet during their burlesque (it should have been the other way around). Bugs soon finds himself staring down the barrels of a shotgun, causing the scared Bugs to utter timidly, "Eh, what's up, Doc?" The audience reacts with laughter and applause, making Bugs Bunny and Elmer Fudd continue the act and later adopt their well-known hunter vs. hare formula, which Bugs wins repeatedly. 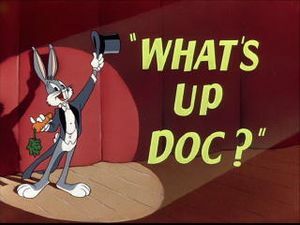 The song "What's Up, Doc?" lyrics are heard for the first time. The song's tune had been first used a few years earlier, usually over the title credits of other Bugs Bunny cartoons. This cartoon appears in Looney Tunes Golden Collection, Volume 1, CD 1. It is followed by several other Bugs cartoons using the instrumental version of the theme in the intro. One year later saw Porky Pig in a picture titled "The Wearing of the Grin", which was one of the titles on the fake marquee. The young Bugs plays Franz Liszt's Hungarian Rhapsody on a piano. He previously made a reference to Liszt in Rhapsody Rabbit, and would make another one in My Dream Is Yours. The title cards of 'Buffalo' and 'New York' both contain relevant musical allusions to the Warner Brothers musical film 42nd Street (1933) with tunes from the songs "Shuffle Off to Buffalo" and "Forty-Second Street" respectively. In the sequence where Bugs is in the traveling vaudeville show with Elmer and decides to come up with a new act so he won't be made a fool like he was in the previous scenes, the version that aired on ABC cut a slightly risqué joke between Elmer and Bugs (Elmer: "Hey, pinhead! You know how to make antifreeze?" Bugs: "Yeah. Hide her nightgown!") and the part where Elmer holds a rifle to Bugs' mouth after Bugs upstages him. This was also cut when it aired on The WB. The CBS version left in the "antifreeze" joke, but cut the part after that where Bugs slams a pie in Elmer's face, sprays him with seltzer, and whomps him with a mallet before jumping out of his clown suit and shuffling offstage and the part where Elmer holds a rifle to Bugs's mouth. This cartoon is available on the Looney Tunes Golden Collection: Volume 1.